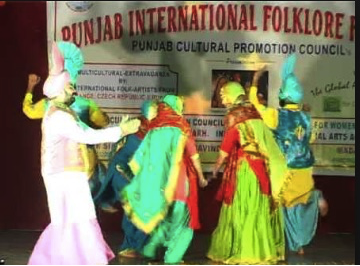 It was a coming together of cultures from around the world at the Punjab International Folk Dance Festival organized by the Punjab Cultural Promotion Council (PCPC) in collaboration with Ishmeet Singh Institute at the Ishmeet auditorium on Monday evening. The fusion of African, Colombian, Cuban, Mexican, Punjabi bhangra and Indian classical dances was well received by the audience, students and dignitaries. La Escuela de Danzas Folcloricas-Palma Africana folk dance ensemble from Colombia was the highlight of the mega event. Bringing the diverse cultures of the world on one platform, the event propagated the message of love, peace and harmony. Colombians led by group director Madam Maria Carmen Melendez took the stage by storm with their vibrant presentation of folk dances mapale, mix carnaval, salsa and guacherna on the scintillating beats of Colombiano music comprising drums (Tambora) and a pair of Maracas, displayed by artist Alfonso. Do the arts create a basis for a culture of peace?, What is, or should be, their role in our movement? Sharing the theme, festival director Dr Davinder Singh Chhina said that PCPC has invited 43 international folk delegations from all over the world to attend the dance festival since 2002 to promote culture of peace, international friendship, multiculturalism and cultural diversity. The Cumbia dance represented the culture hybrid of European, African and other indigenous communities while spreading the message of happiness; Bambuco, a musical on Colombia, emulated the process of love expressed by farmers, while Guacherna depicted festivities of Barranquilla, the native city of the guest delegations. Carnaval De Barranquilla was a cultural representation and a mix of different dancing styles which expressed the period of colonization. The salsa beats took the audience on a tour of Cuba, while mapale and bullerengue depicted the cultural diversity of Colombia. Closing the concert, Colombians performed bhangra along with Punjabi artists. Colombian artists Carmen Sanjuan, Dany, Alfonso and Andrea were all praise for the hospitality and vast heritage of Punjab.